Global warming is the gradual rise of the earth's near-surface temperature over approximately the last hundred years. 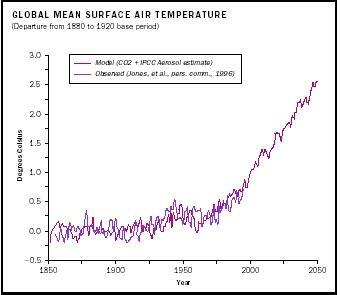 The best available scientific evidence—based on continuous satellite monitoring and data from about 2,000 meteorological stations around the world—indicates that globally averaged surface temperatures have warmed by about 0.3 to 0.6°C since the late nineteenth century. Different regions have warmed—some have even cooled—by different amounts. Generally, the Northern Hemisphere has warmed to a greater extent than the Southern Hemisphere, and mid to high latitudes have generally warmed more than the tropics. Since the advent of satellites, it has become possible for scientists to thoroughly monitor the earth's climate on a global scale. 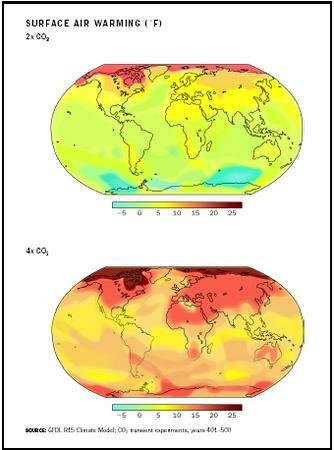 To examine the historical climate record, however, scientists have to use earlier, sparser forms of measurement, such as long-standing temperature records and less exact "proxy" data, such as the growth of coral, tree rings, as well as information from ice cores, which contain trapped gas bubbles and dust grains representative of the climate in which they were deposited. The bubbles in these cores contain oxygen, particularly oxygen isotopes 180 to 160, which are sensitive to variations in temperature. From the ratio between these isotopes at varying ice depths scientists can reconstruct a picture of the temperature variations over time in specific locations. Greater measurement uncertainty surrounds the earlier parts of this record because of sparse coverage (especially in ocean regions). Despite this uncertainty, the balance of scientific evidence confirms that there has been a discernable warming over the last century. 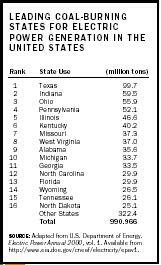 SOURCE: Adapted from U.S. Department of Energy. Electric Power Annual 2000 , vol. 1. Available from http://www.eia.doe.gov/cneaf/electricity/epav1. effect—keeps the earth warm: In its absence, the earth would be about 33°C cooler than it is now. However, as the concentration of greenhouse gases increases (due largely to human activities), most scientists agree that the effect is expected to intensify, raising average global temperatures. © Reuters NewMedia Inc./Corbis. Reproduced by permission. However, the earth's climate is known to vary on long timescales. The existence of naturally occurring ice ages and warm periods in the distant past demonstrates that natural factors such as solar variability, volcanic activity, and fluctuations in greenhouse gases play important roles in regulating the earth's climate. A minority of scientists believe that purely natural variations in these factors can account for the observed global warming. Climate forecasts are inherently imprecise largely because of two different sorts of uncertainty: incomplete knowledge about how the system works—understandable for a system governed by processes the spatial scales of which range from the molecular to the global and uncertainty about how important climate factors will evolve in the future. A variety of factors affect temperature near the surface of the earth, including variability in solar output, volcanic activity, and dust and other aerosols, in addition to concentrations of greenhouse gases. 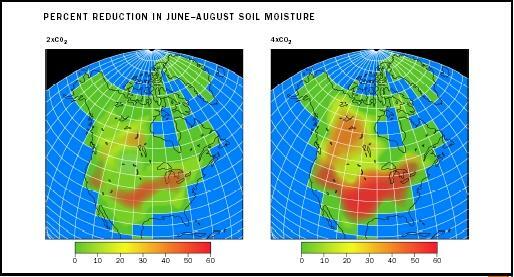 record using only natural variability in climate models have proved inadequate. The Third Assessment Report (2001) of the Intergovernmental Panel on Climate Change (IPCC) attributes some 80 percent of recent rises in global temperature to human activities, with other important contributions coming from volcanic and solar sources. Over the coming century, likely effects of continued warming include higher daily maximum and minimum temperatures, more hot days over most land areas, fewer frosts in winter, fewer cold days over most land areas, a reduced daily range of temperatures, more extreme precipitation events (all very likely), increased risk of drought, increases in cyclone peak wind, and precipitation intensity (likely). 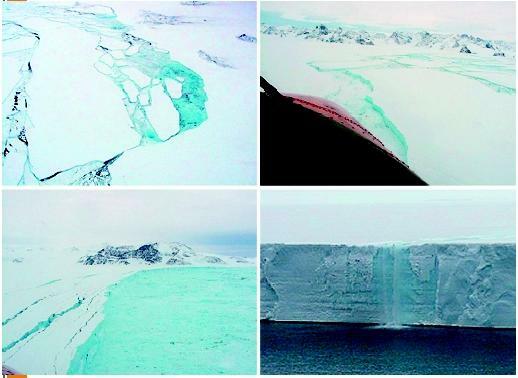 Other effects, such as the disintegration of Antarctic ice sheets, carry potentially enormous implications, but are considered very unlikely. These effects are likely to be beneficial in some places, but disruptive in most, and as a consequence, governments around the world have begun planning responses to climate change. These fall into two categories: mitigation, which involves taking action to prevent climate change (usually by cutting greenhouse gas emissions) and adaptation, which involves adapting to the effects as and after they happen. 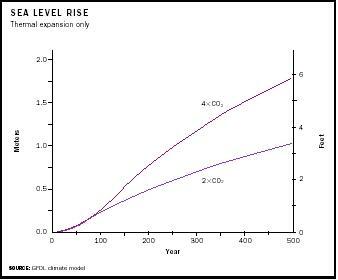 For example, if sea levels rise in the next century due to thermal expansion of the oceans, low lying areas such as the Netherlands and Bangladesh may be flooded. A mitigation strategy would involve trying to cut emissions to forestall the heat-driven sea level rise, whereas an adaptation strategy might be to build large barriers to prevent the sea level rise from flooding these countries. In wealthy countries such as the Netherlands this is perhaps a viable option. It is not so clear that Bangladesh—one of the world's poorest countries—will be in a position to implement this sort of strategy. Because of the potentially serious ramifications of continued global warming, the World Meteorological Organisation and United Nations Environment Programme jointly established the IPCC in 1988. It assesses scientific and socioeconomic information on climate change and related impacts, and provides advice on the options for either mitigating climate change by limiting the emissions of greenhouse gases, or adapting to expected changes through developments such as building higher flood defenses. In the wake of the general increase in the awareness of environmental issues in the Western world since the 1970s, global warming has become an important political issue in the last decade. Following the successful implementation of the Montréal Protocol (1987) that prohibited the production of ozone-depleting gases (i.e., chlorofluorocarbons [CFCs], halons, and carbon tetrachloride) starting in 2000, the international community sought to address the problem of global warming in the Kyoto Protocol (1992). This involves industrialized countries taking the lead on cutting greenhouse gas emissions. The protocol requires them to decrease their emissions to 90 percent of their 1990 levels. The Kyoto Protocol comes into effect if fifty-five parties to the convention ratify the protocol, with "annex 1" (or industrialized) parties accounting for 55 percent of that group's carbon dioxide emissions in 1990. This approach has proved controversial for a variety of reasons: (1) It applies primarily to industrialized countries, freeing some of the world's worst polluters, such as China and Saudi Arabia, from having to comply; (2) the reductions are arbitrarily fixed at 10 percent of a country's 1990 level, irrespective of whether that country is a big polluter, like the United States, or a relatively small polluter, like Sweden; (3) disagreements about whether the cuts imposed by the treaty will actually be worth the economic costs; (4) the treaty targets only gross emissions rather than net emissions—during the negotiations key differences emerged between a group of nations that favored the use of man-made forests as "carbon sinks" planted to soak up carbon emissions, and countries that believed this to be an inadequate response. Although the Kyoto Protocol has been enthusiastically backed by European countries, various wealthy countries remain outside the treaty, most notably Australia and the United States. The U.S. decision to not sign the Kyoto Protocol has proved particularly controversial, as the United States emits some 23 percent of global greenhouse emissions, while only containing 5 percent of the global population. The current Bush administration does not intend to ratify the agreement on the grounds "that the protocol is not sound policy," according to U.S. Undersecretary of State Paula Dobriansky. SEE ALSO C ARBON D IOXIDE ; CFCs (C HLOROFLUOROCARBONS ) ; G REENHOUSE G ASES ; H ALON ; M ETHANE (CH 4 ) ; NO x (N ITROGEN O XIDES ) ; O ZONE ; T REATIES AND C ONFERENCES . Burroughs, William James. Climate Change: A Multidisciplinary Approach. Cambridge University Press, 2001. Climate Change 2001: The Scientific Basis, The Intergovernmental Panel on Climate Change Third Assessment Report. Cambridge University Press, 2001. Harvey, L.D. Danny. Global Warming: The Hard Science. Prentice Hall, 1999. Intergovernmental Panel on Climate Change Web site. Available at http://www.ipcc.ch . Intergovernmental Panel on Climate Change. "Climate Change 2001: IPCC Third Assessment Report." Available at http://www.grida.no/climate/ipcc_tar .